This is the Happy Kava Kanna Kava Tincture Blend. Happy Kava Brand has expertly formulated a line of Kava Tinctures that take the best of organic or wildcrafted herbs. There are a number of herbs that have made it into the mainstream. Even those not super familiar with different herbal products have now probably at least heard of the 12 herbs we have chosen to blend with our Noble Kava Root with the Happy Kavalactone lineup. Kava can help promote feelings of well being and calmness. Kanna is equally as effective on its own. So this match is as perfect as a match can get, and when we combined these two, the pleasurable effects have to be felt to be believed. Both Kava and Kanna are safe and effective dietary supplements, so what better way to experience the best that the individual herbs have to offer, than to experience them in a Happy Kava Kanna Kava Tincture Blend? They go on to say; “…it can cause mild euphoria, initially with stimulation and later with sedation. Long-term use in the local context followed by abstinence has not been reported to result in a withdrawal state.” That’s an extremely promising statement for those looking for the relaxing and pleasurable aspects of what Kava has to offer. We add the equivalent of one teaspoon of Kanna into every serving of this tincture (4 dropperfuls is a single dose). We don’t add any other filler herbs that may or may not actually have the pleasurable mood elevating properties that Kanna has. All we have in this award winning Kanna Kava Tincture Blend tincture is pure Noble Kava root with a 2-4-6 or 4-2-6 Kavalactone lineup and pure food grade Sceletium tortuosum (Kanna). *These statements have not been evaluated by the Food and Drug Administration. 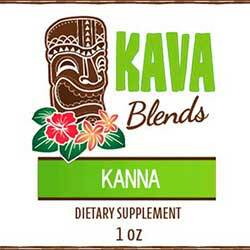 This Happy Kava Brand Kanna Kava Tincture Blend is not intended to cure, treat, diagnose, or prevent any disease.